First impressions are everything, especially when it comes to your home. Whether you’re looking to sell your home or just enjoy it while you’re there, a little curb appeal goes a long way. Even the simplest of things can make an enormous impact on your overall curb appeal. 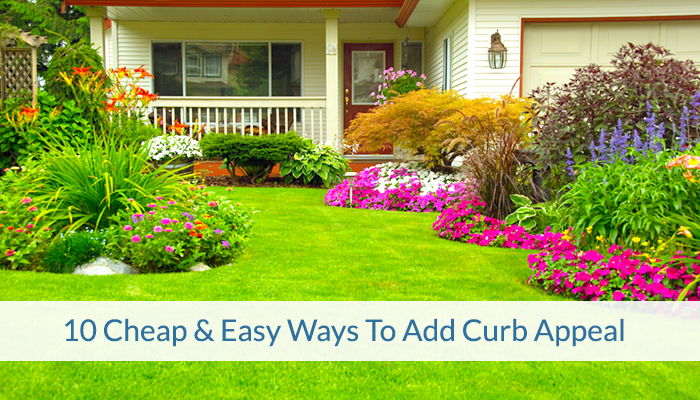 Check out these 10 cheap and easy ways to add curb appeal to instantly update your home! It might not seem like a big deal, but a “junky” mailbox can be a huge eyesore. Consider replacing it to match the exterior of your home, or just paint it for an instantaneous makeover. If your mailbox is already up to par, add some life to the wooden base of your mailbox with some wood stain. Another great option is to add a small flower bed at the base of the support for extra color. This should go without saying, but some basic lawn care will add significant value to your home’s curb appeal, especially for a potential buyer. Knowing you’ve put the time and effort to keep your lawn well-manicured speaks volumes for your entire home. In most climates, grass seed should be planted before or after the summer months. This is for several reasons, one of which is temperature. To plant the seed, you must disrupt the soil, which makes it all too easy for pesky weeds to grow when the temperature is adequate. Another benefit of avoiding the summer heat is water. Freshly planted seeds will need ample amount of water each day to combat the high temperatures. Now that we’ve taken care of the mailbox and lawn, let’s move onto the walkway. Your walkway transports your guests and potential buyers to and from your home. Be sure to give it the attention it deserves. First things first, what kind of shape is the pathway in? If your walkway is crumbling under your feet, it’s more than just an eyesore; it’s hazardous. If the look you’re aiming for is beyond DIY, reach out to a contractor in your area for guidance. Once you’ve completed your walkway, spruce it up with lighting. If your current walkway just needs a little TLC, use a little elbow grease to weed and power wash it to it's original state. You won’t believe what a few trees and added shrubbery will do to help liven up your front yard. Each home is different, so be sure to plan accordingly. If you’re residing in a bungalow, invest in slightly shorter bushes in front of the home. While you want landscaping to be eye catching, you don’t want it to take over your entire home. On the flipside, if you have a larger, two-story house, you might be able to branch out into something a bit more substantial. Before your first visit to the nursery, measure areas you’re looking to makeover. The last thing you want is to buy too much or too little of something. Once you’re at the nursery, find items you like and arrange them according to your previously taken measurements. Before you dig the first hole, contact someone from the city to mark off any hidden gas or water lines! This is a costly mistake that can be avoided with a simple phone call. Don’t let a little color intimidate you! Introduce bright colors among shrubbery with fun and easy-to-care-for flowers. Start by picking your favorite color and repeat it throughout your landscape. This helps create a sort of cohesiveness to your overall yard instead of random colors scattered throughout. Consider adding flower boxes to exterior windows for an additional pop of color. Color can also help to direct attention to a certain area while pulling it away from something else. A great example of this is if your air conditioning unit is in plain sight, plant some brightly colored flowers several feet away from it, so they gain the focus instead. It’s easy to ignore fading and chipping paint on a house that you walk into every day. Step outside and see if there are some areas on the exterior of your home that need some freshening up. Along with touching up your current paint, take a look at your front door. Touches of color aren’t just for the flower beds. A beautifully painted front door can add warmth and a touch of style that will set your front steps apart from the rest! Before we get to the decorative portion of our DIY, make sure to do some major cleaning on the outside of your home. This includes gutters, windows, porch and walkways. The last thing you want to do is haphazardly add things when the actual base of your home is lacking. It’s not the most exciting portion of this project, but it is no less important. Now for the fun stuff! If you have the space for a small seating area, create a front porch oasis! A clean and cozy front porch sets the mood for the rest of the home. Not only is this an inviting addition, it also gives an illusion of more square footage! Even if you don’t have a large space to occupy, a simple chair, side table and lamp are enough to make a statement. Adding small touches to coincide with the seasons is one of the easiest way to add warmth without taking an enormous hit to your budget. Venture to your local farmers market in the fall for the best variety of pumpkins and dried flowers to fill your front porch! When it comes to Christmas, don’t feel the need to compare your home to Clark Griswold’s. Even the slightest amount of lighting and greenery on the outside of the home is enough to spread Christmas cheer! This can be anything from an electrical box to your air conditioning unit. You want to focus to be on your home and the beautiful landscaping you’ve taken the time to perfect. Hiding your air conditioning unit and trash cans in a small shed or building a lattice to keep these more unsightly items out of view! Follow our Space Simply blog! If you are looking to buy your dream home or selling your current home, look no further than Space Simply! Call us today at (515)423-0899 or connect with us online.